It’s this: trainers seem to be focused on completely wiping their clients out and getting them crawling out of the gym. No pain, no gain right? I mean if you leave your clients so tired that they can’t even move, then they’ll feel like they’re getting their money’s worth. Right? But you could also be making the biggest mistake of your professional life. Because if you’re not delivering fantastic results to your clients, then you’re going to see your business dry up faster than a drop of water in the Sahara Desert. You don’t need to run your boot campers and personal training clients into the ground to give them great results. All you need to do is create a series of well-planned circuits that match their fitness levels and their goals. Keep it simple – bodyweight exercises, dumbbells, kettlebells, bands and sliders. That’s all you need to create awesome workouts that will get your clients coming back for me. You don’t even need to spend a single second planning these workouts yourself. That’s because fitness expert Dave Randolph has done all the hard work for you. And he’s serving it up on a silver platter in this brand new package! 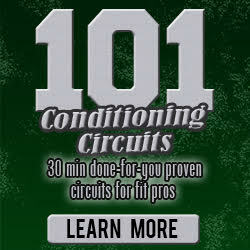 101 awesome and super-effective conditioning circuit workouts that your clients are sure to love! These 30-minute workouts can be scaled up or down to meet your client’s fitness levels and goals. And you know what’s even better than having this huge collection of workouts and exercises at your fingertips? It’s getting it all for a fantastic price! If you act now, you can grab the special launch week introductory pricing of just $29 for the package. That’s less than 29 cents for each of the workouts. What a fantastic bargain. And do it now, because the special introductory offer won’t last long! P.S. Stop driving your clients into the ground and start getting them great results instead! Click here to grab yourself a great deal! Love Fitness? Make It A Profitable Career!